Betty Bachz attended the Marie Claire Future Shapers Awards drinks reception at One Marylebone on Tuesday (September 26) in London. 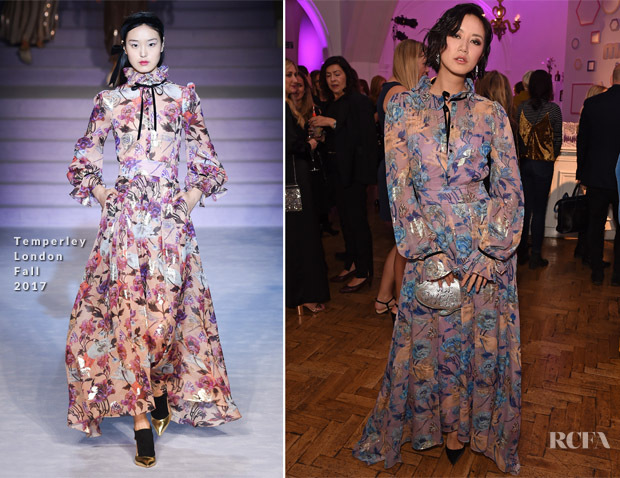 As we know, Betty tends to favour an edgy red carpet look, however on this occasion she wore an ultra feminine floral print Temperley London Fall 2017 floaty dress. Even with the demure charm imbue by the frock, Betty’s cool IT girl persona still manages to shines through. Sophia Webster black pumps ground the look, but its the silver Sophia Webster clutch I love here as it adds a touch of flare while enhancing the floral silver foil details on the dress.